Traditionally, programmes have focussed on training ophthalmologists to deliver cataract surgery. In some settings, due to a lack of ophthalmologists and general physicians, part of this task has been shifted to non-physician medical assistants/clinical officers and nurses. Since this cadre can be trained in a shorter time period and is typically easier to deploy and retain in rural areas, this human resource strategy is seen by some as an effective way to achieve VISION 2020 goals in Africa, although this is debated [3–7]. Correction of refractive errors is another key eye health service which can be shared in a convenient, cost-effective manner by both optometrists and a wide range of personnel such as ophthalmic assistants, opticians and other cadres . ‘Surgeons’: considered to be (i) ophthalmologists (physicians (Medical Doctor or equivalent degree) who specialise in the eye and visual system) and (ii) cataract surgeons (generally non-physician ophthalmic nurses or clinical officers additionally trained in cataract surgery or, in two countries (Democractic Republic of Congo and Madagascar), non-ophthalmologist general physicians who conduct cataract surgery with limited training in ophthalmology). ‘OCO/nurses’: (iii) ophthalmic clinical officers (OCOs)/medical assistants and (iv) ophthalmic nurses (both non-physician practitioners with an advanced (minimum 1 year) qualification in ophthalmology, including ‘techniciens supérieurs en ophtalmologie’ (TSOs) in Francophone countries). ‘Refractionists’: (v) optometrists (personnel with Bachelor of Science or diploma in optometry (normally 3–4 years)) and (vi) mid-level refractionists (all other mid-level personnel with refraction training who perform refractions as a primary duty including refractionists, ophthalmic assistants/technicians, low vision specialists, opticians and equivalent). In VISION 2020 documents, cataract surgeons, OCOs and ophthalmic nurses are combined as ‘mid-level personnel’ and share a single target . In our analyses, we collected and reported separate data on all three cadres and combined cataract surgeons with ophthalmologists in a new ‘all surgeons’ category to highlight human resource needs associated with cataract surgical performance. Similarly, optometrists and mid-level refractionists were reported separately and combined in some analyses in an ‘all refractionists’ category. Surgeons per million population in 2011 and 2020 (projected). Complete national workforce entry and exit data needed to make year 2020 projections were limited and differed by cadre. Whereas 2011 ratios could be calculated for surgeons and ophthalmic clinical officers (OCOs)/nurses in 21 countries, and in 18 countries for refractionists, year 2020 ratios could only be calculated in 14 countries for surgeons, 15 for OCOs/nurses, and 7 for refractionists (16 countries in total contributed data for analysis of at least one cadre). Year 2020 cataract surgery rate projections were limited to the countries for which surgeon projections could be made. 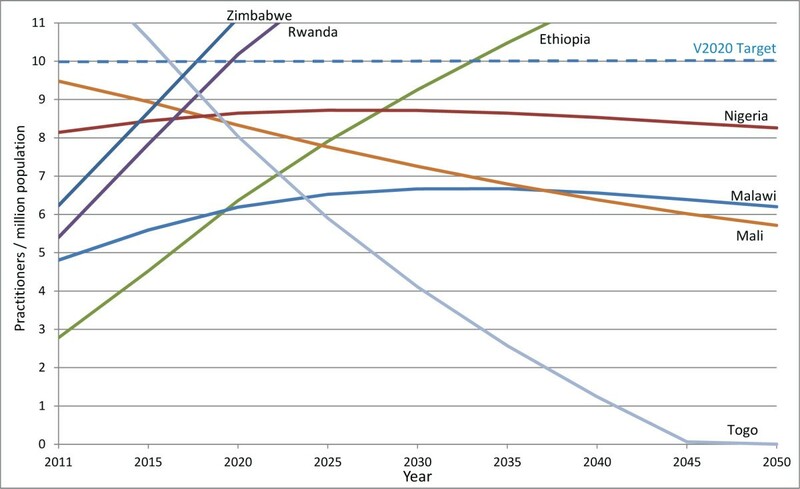 Data for 2011 are only presented here for countries in which projections could be made. 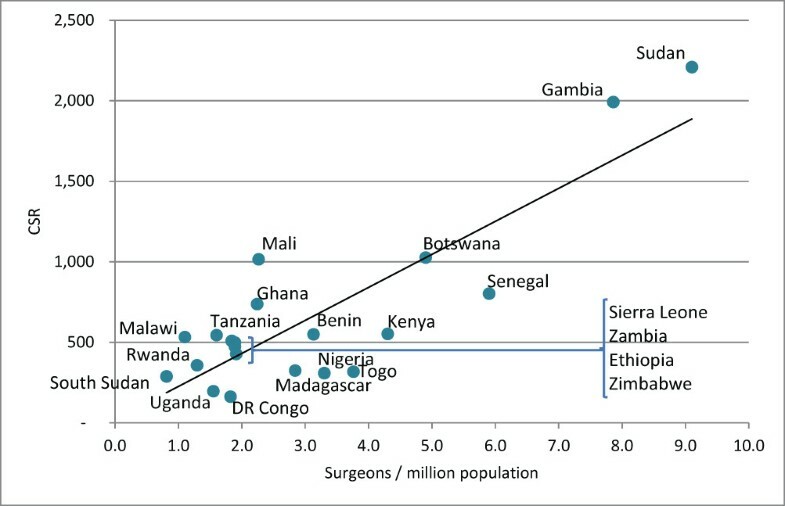 VISION 2020 projected performance: surgeons ratio. 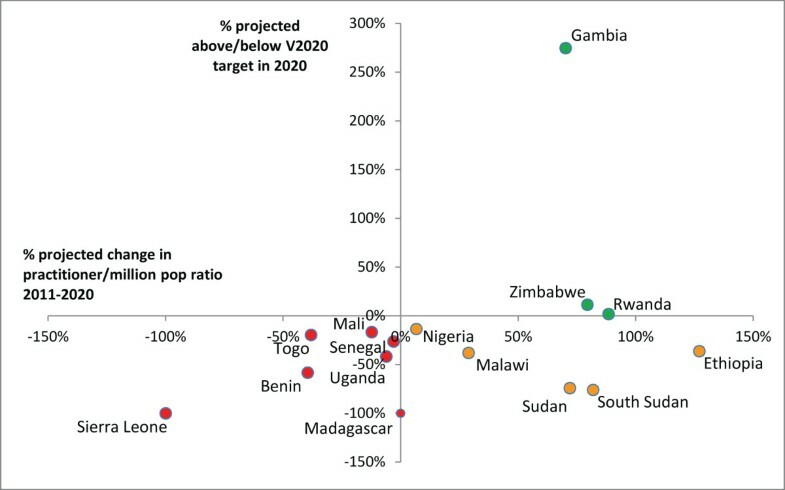 Countries in green are expected to be above target in 2020, countries in yellow are below target but their practitioner-to-population ratios are expected to increase, countries in red are below target and their ratios are expected to decrease. Insufficient information was available to identify whether ratios were increasing or decreasing in two countries currently above target (Botswana and Kenya) and five countries currently below (Democratic Republic of Congo, Ghana, Uganda, Zambia and Zimbabwe). Figures in bold indicate ratios for combined categories of practitioners (rows) or for the sub-Saharan Africa region (columns). All indicators are ratios of practitioners or surgeries per million population, except where noted. For further details of proportional population group in the region and by country, see Additional file 1. Projected surgeon-to-population ratios 2011–2050 in five selected countries. 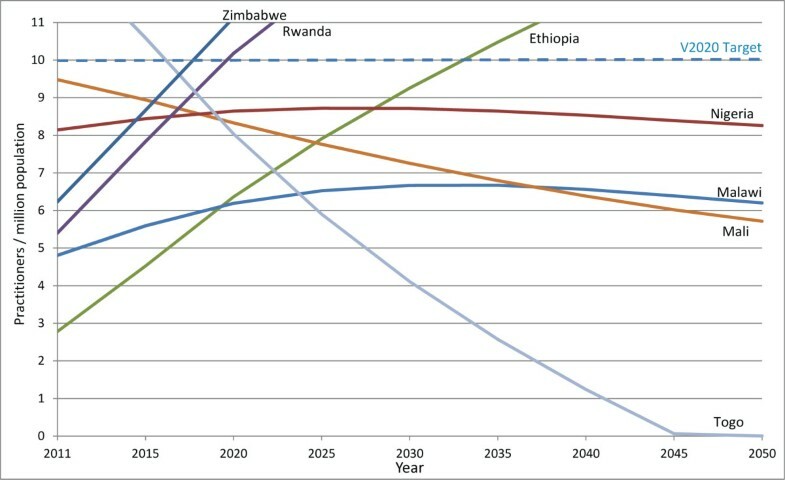 Projected surgeon-to-population ratios are presented for four countries that are currently below the VISION 2020 target but are projected to have increasing ratios between 2011 and 2020, and for one country (Togo) where the ratio is expected to decrease, even though it was close to meeting the VISION 2020 target in 2011. In three countries with increasing ratios, proportional practitioner population increases can eventually be expected to be outpaced by proportional general population increases and the VISION 2020 target will not be achieved without further intervention. Practitioner population growth is only expected to be rapid enough to replace the VISION 2020 practitioner shortage without intervention in Ethiopia by 2034. Ophthalmic clinical officers/nurses per million population in 2011 and 2020 (projected). VISION 2020 projected performance: Ophthalmic clinical officers/nurses ratio. Countries in green are expected to be above target in 2020, countries in yellow are below target but their practitioner-to-population ratios are expected to increase, and countries in red are below target and their ratios are expected to decrease. Insufficient information was available to identify whether ratios were increasing or decreasing in two countries currently above target (Botswana and Ghana) and four countries currently below (Democratic Republic of Congo, Kenya, Tanzania and Zambia). 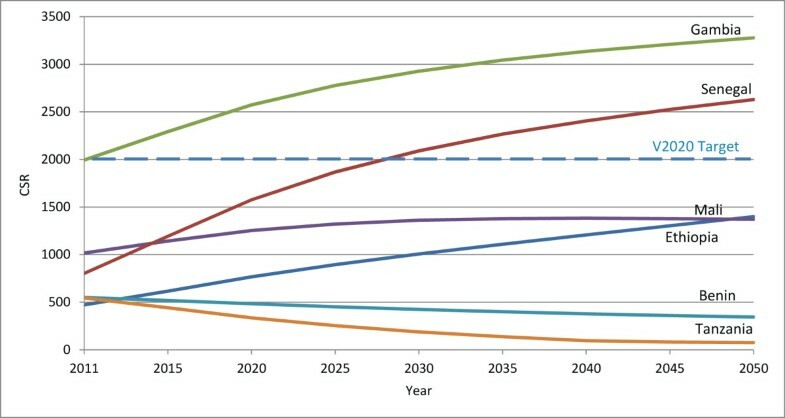 Projected ophthalmic clinical officers/nurses-to-population ratios 2011–2050 in seven selected countries. Projected ophthalmic clinical officers/nurse-to-population ratios are presented for five countries that are currently below the VISION 2020 target but are projected to have increasing ratios between 2011 and 2020, and for two countries (Mali and Togo) where the ratio is expected to decrease, even though it was above (Togo) or close to (Mali) meeting the VISION 2020 target in 2011. In two of the countries (Malawi and Nigeria) with increasing ratios, proportional practitioner population increases can eventually be expected to be outpaced by proportional general population increases and the VISION 2020 target will not be achieved without further intervention. Practitioner population growth is expected to be rapid enough to replace the VISION 2020 practitioner shortage without intervention in Zimbabwe and Rwanda before 2020 and in Ethiopia by 2034. Refractionists per million population in 2011 and 2020 (projected). VISION 2020 projected performance: refractionists ratio. Countries in yellow are expected to be below target in 2020 but their practitioner-to-population ratios are expected to increase, and countries in red are below target and their ratios are expected to decrease. Insufficient information was available to identify whether ratios were increasing or decreasing in the remaining 14 countries currently below target. Cataract surgeries per million population (CSR) in 2011 and 2020 (projected). Estimates of surgeries for "2011" come from 2008 for Malawi, from 2010 for Benin, Botswana, Democratic Republic of Congo, Ethiopia, Gambia, Ghana, Kenya, Madagascar, Rwanda, Senegal, Sierra Leone, Sudan, Uganda and Zimbabwe, and from 2012 for South Sudan. The national estimate of 2011 cataract surgeries performed in Nigeria was based on proportional data provided from 13/37 states. In Botswana, surgeries data came from government facilities only. 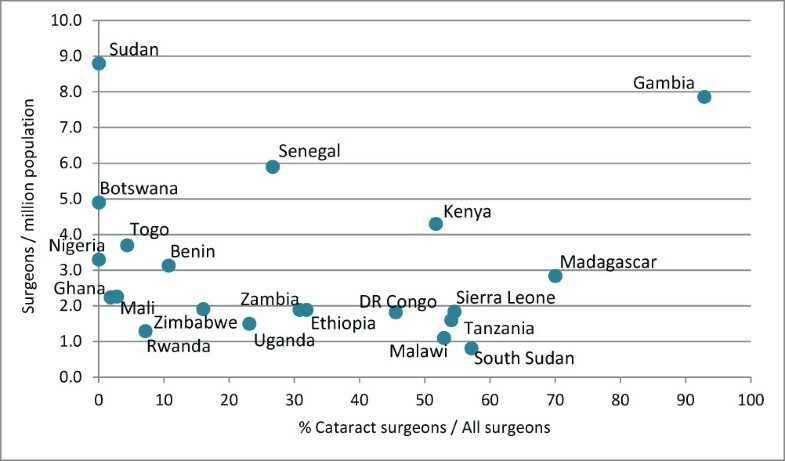 Projected cataract surgery rates 2011–2050 in six selected countries. Projected cataract surgery rates (CSRs) are presented for seven countries to illustrate different patterns of growth in the sample. 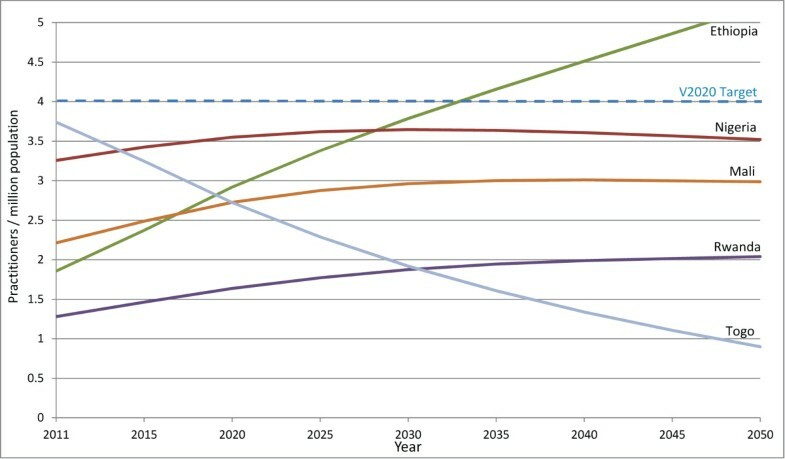 Three countries that are currently below the VISION 2020 target are projected to have increasing ratios between 2011 and 2020. 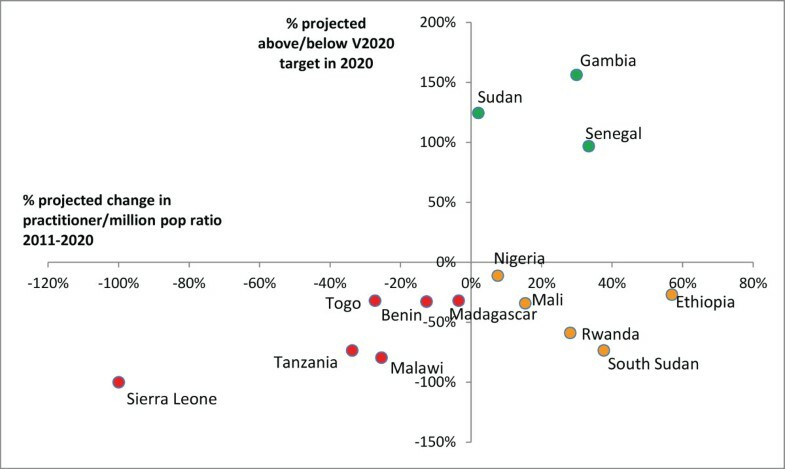 Senegal will eventually reach the VISION 2020 target without intervention in 2028, Ethiopia may reach the target after 2050, but in Mali, proportional growth in CSR will eventually be outpaced by growth in the general population and the VISION 2020 target is never expected to be achieved without intervention. Currently at the VISION 2020 target, Gambia’s CSR is expected to increase further, while the CSR in Benin and Tanzania, currently below target, is expected to decrease further, beyond 2020. Projected cataract surgery rates (CSRs) in year 2020 by country, under different intervention scenarios. Relationship between surgeons-to-population ratio and cataract surgery rate (CSR) in 2011. CS, cataract surgeon. P-values in bold indicate a difference in proportions (risk ratios) significant at the 5% level. Relationship between surgeon-to-population ratio and proportional presence of cataract surgeons in workforce in 2011. Relationship between cataract surgery rate (CSR) and proportional presence of cataract surgeons in workforce in 2011. 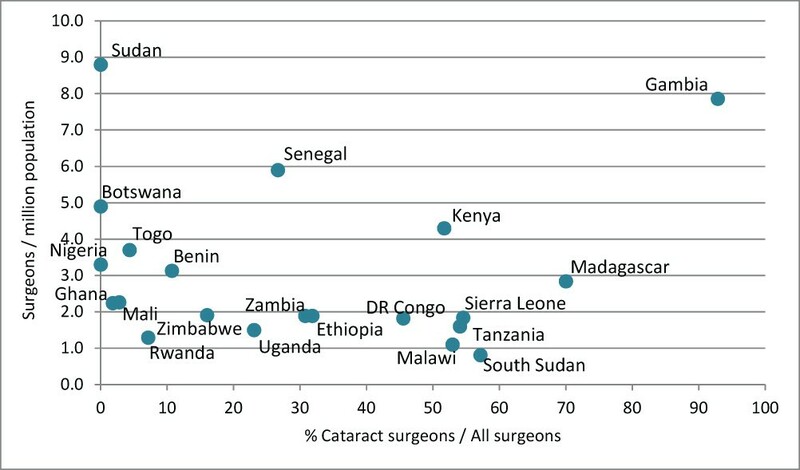 That countries with cataract surgeons, who are trained to specialise in this type of surgery, do not display higher CSRs is counter-intuitive and deserves further study to investigate the complex factors which underlie this finding. We could not, for example, verify that all surgeons (either cataract surgeons or ophthalmologists) reported in the 2011 active workforce were actually performing surgeries to assess efficiency of the surgically active workforce for either cadre, specifically. 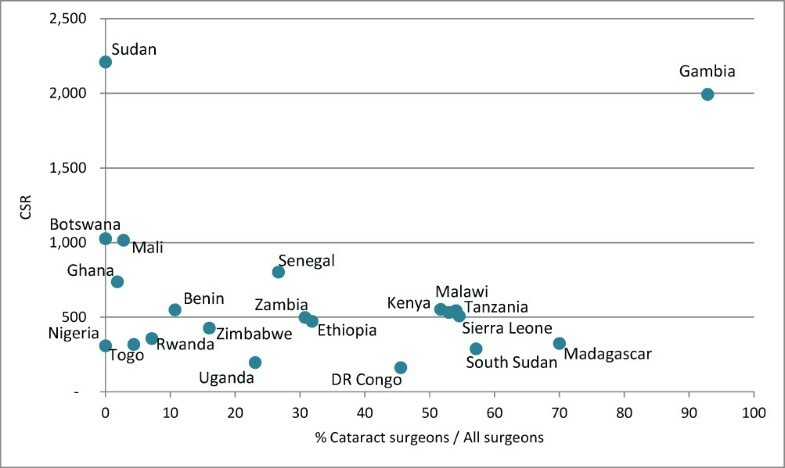 Cataract surgical performance in Africa varies widely between individual surgeons and has been associated with time since graduation, access to surgical equipment and working in the more highly resourced non-governmental or private sectors [6, 7, 12]. Additionally, contrary to our initial assumption, not all ophthalmologists in our sample can necessarily be assumed to have been trained in cataract surgery (Serge Resnikoff, personal communication). Our predictions of future CSR considered only future changes in workforce growth (based on current trends), but explored how CSRs could be improved under additional intervention scenarios. For most countries, a combination of interventions to improve both surgeon numbers and surgical efficiency of the workforce would be needed to achieve the VISION 2020 target. Naturally, neither statistic reflects an assessment of surgical quality of care, another essential component of any programme designed to treat or prevent visual impairment due to cataracts .